In 2008, scientists documented for the first time a staggering phenomenon, long hidden from humanity, in the remote frozen expanse of Greenland. Beneath a gleaming turquoise lake atop the ice sheet, a monstrous crack suddenly split the lakebed from edge to edge. Torrents of water surged through the crack—at times flowing out of the bottom of the lake faster than the water flowing over Niagara Falls. In less than two hours, the crack drained the entire lake, sending a deluge thousands of feet through the ice, all the way down to the bedrock. The discovery was published in the journal Science by a research team led by Sarah Das and Mark Behn at Woods Hole Oceanographic Institution (WHOI) and Ian Joughin at the University of Washington. It stirred interest not only because it was dramatic, but also because it had dramatic implications for billions of people far removed from Greenland—in New York City, Bangladesh, and other coastal areas. 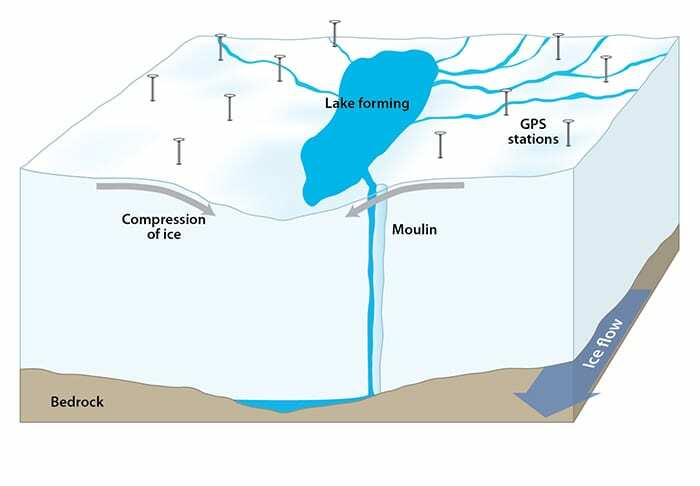 The water that drained from the lake to the base of the ice sheet lubricates the interface between ice and rock, allowing the ice sheet to slide faster toward the coast. That accelerates the outflow of ice from land into the ocean, causing sea levels to rise faster. Thousands of these supraglacial lakes form on the ice sheet each spring as sunlight returns to Greenland after long dark winters and begins to melt snow and ice. The water streams into depressions in the ice sheet, filling them up to create the lakes. As Earth’s changing climate warms the region and creates more lakes, would that lead to more cracks, faster-flowing ice sheets, and faster-rising sea levels? But in 2008, the scientists found only that these cracks, called hydrofractures, did occur. How they formed remained a mystery. 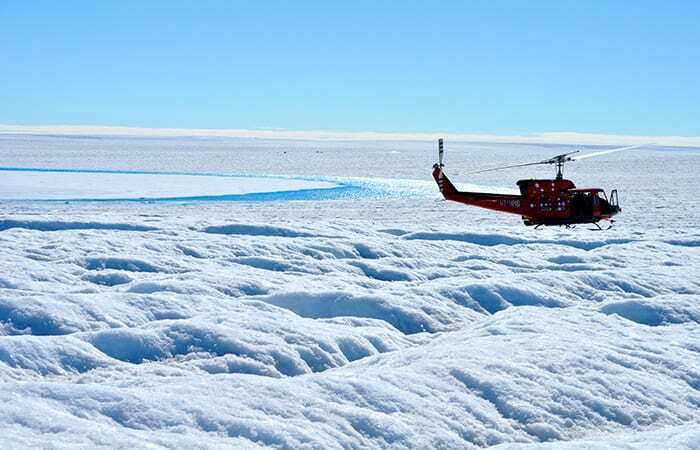 Before scientists could predict more precisely how supraglacial lakes might affect sea level rise as climate conditions shift in the future, they needed to uncover the mechanisms that triggered the cracks. That 2008 Science paper also stirred the imagination of an undergraduate student at Wellesley College named Laura Stevens. She majored in geosciences, and for one class assignment, she was asked to hypothesize what the economy and climate of Kangerlussuaq, Greenland, would look like 100 years from now. 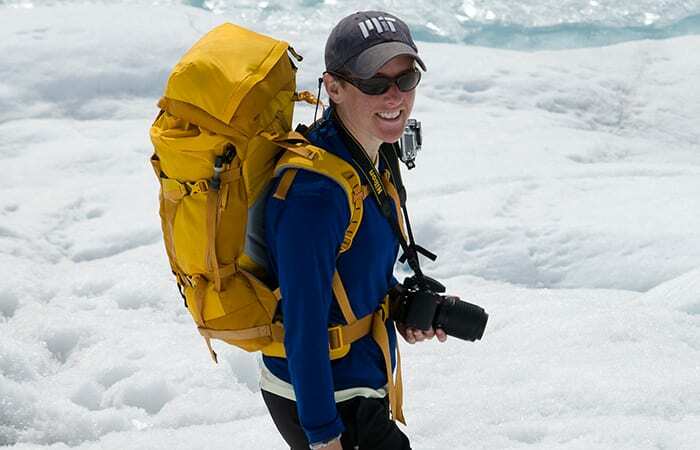 In her first year as a graduate student, Stevens spent the summer of 2013 camped near North Lake, the 1.5-mile-long lake in southwest Greenland where Das, Behn, and colleagues first documented large-scale cracks and lake drainages. “It’s quite beautiful up there,” Stevens said. “It’s very flat, but there are lots of small stream networks every couple meters. It’s almost like you’re on a marsh in some way. There are a lot of stream channels, but instead of everything going in and out with the tides as in a marsh, on the ice sheet, you get a ‘high tide’ during the day, when ice melts and water flows downslope into the lakes. Then you get a ‘low tide’ at night when the water freezes again. Thousands of supraglacial lakes form each spring and summer on top of the Greenland Ice Sheet as sunlight returns to the region. 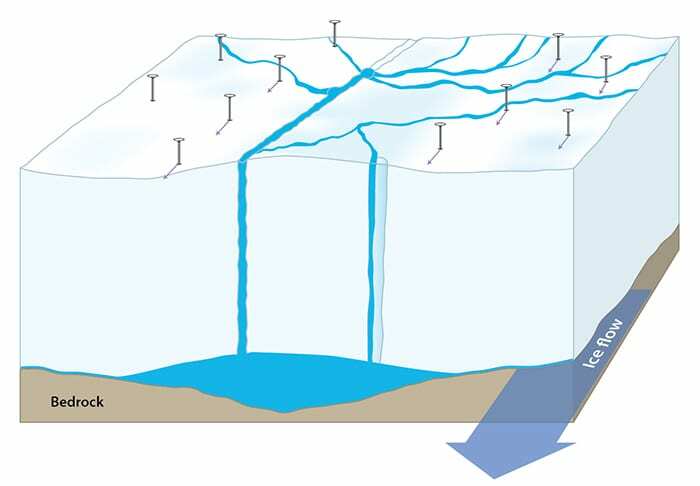 Many lakes disappear within hours when large cracks form below them, draining the lakes and sending torrents of water to the base of the ice sheet. To learn what triggers this phenomenon, a team of scientists installed a network of GPS units around a lake. 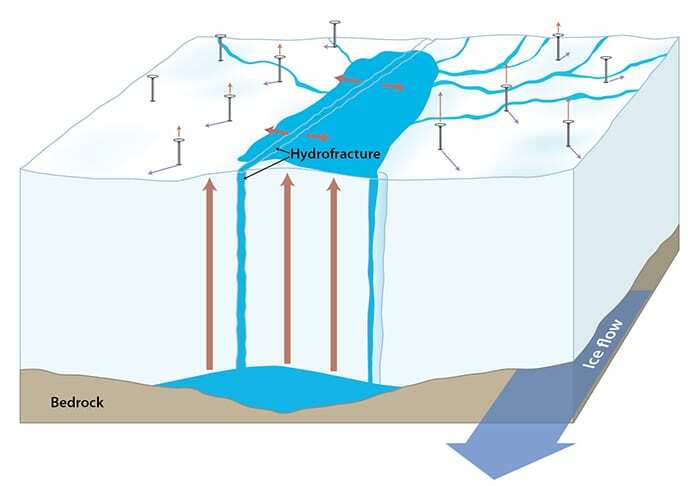 Scientists at first had theorized that the hydrofractures were caused by the sheer weight of the lake water applying pressure on the ice. But the theory broke down when they found large lakes with ample volumes that did not crack and drain. “Those lakes remain on the surface and freeze from the top down during winter like a lake in New Hampshire,” Stevens said. To try to determine why some lakes cracked and other didn’t, the research team deployed a network of 16 GPS units around North Lake. The GPS units move when the ice does, recording subtle movements of the ice before, during, and after three rapid lake drainages in the summers of 2011, 2012, and 2013. Stevens became the focal point of a diverse team that interpreted the data to reconstruct what happened. 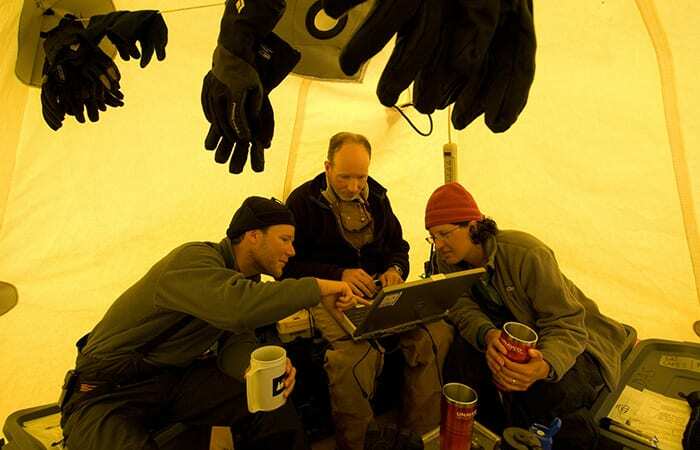 The team included glaciologists Das, Joughin, and his graduate student David Shean; Behn, a geophysicist who ordinarily studies faults and rock deformation in Earth’s crust; and two experts in interpreting GPS data, Tom Herring at MIT and Matt King at the University of Tasmania. Also joining the team was a scientist who had never before studied glaciers, Jeff McGuire, a WHOI seismologist who studies earthquakes. 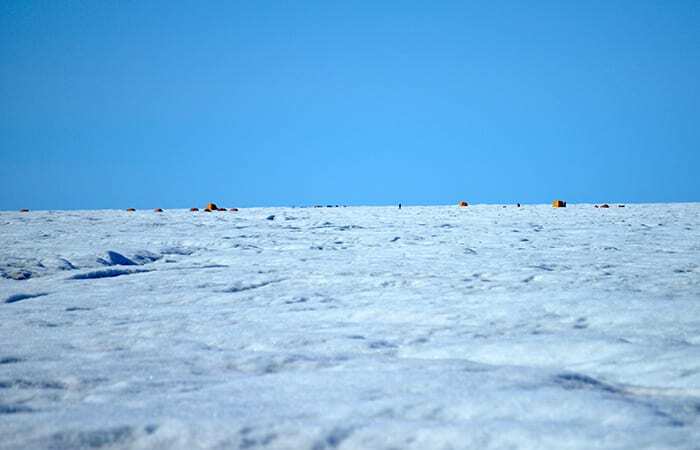 Never before had such a dense array of GPS units been deployed on an ice sheet to collect data on ice movements. But once that was achieved, methods used to analyze earthquakes and rock deformation could be adapted for ice and lake cracks. “The beauty was that instead of waiting a long time for a fault perhaps to do something, everything on the ice happens in hours instead of years, and it happens every summer,” McGuire joked. The GPS network recorded the sudden and momentous movements of the ice sheet surface when the lakebed cracked. It showed that portions of the ice sheet bed beneath the lake can slip up to a foot and a half. That is equivalent to the movement caused by a magnitude-5.5 earthquake. Stevens was lead author of the study, which was published June 4, 2015, in the prestigious scientific journal Nature. The GPS data showed that in the 6 to 12 hours before the lake cracked and drained, the ice around the lake moved upward and slipped horizontally. 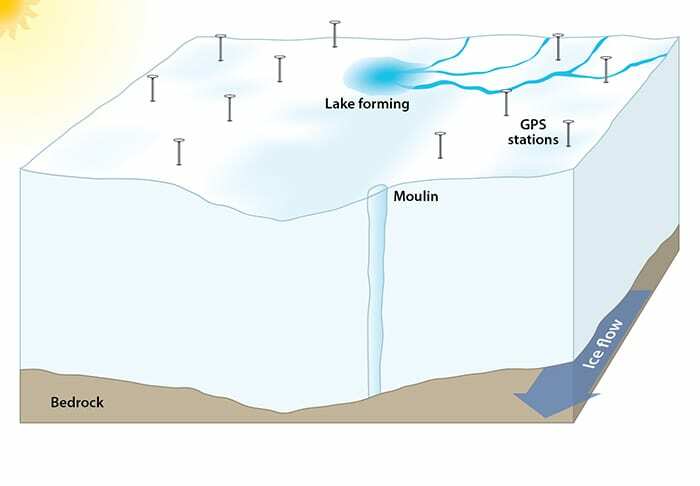 The scientists theorize that meltwater had begun to drain through a nearby system of moulins, or vertical conduits through the ice, which connected the surface to the base of the ice sheet. This accumulating water eventually created a bulge between the bedrock and the base of the ice, which floated the entire ice sheet. That exerted tension at the surface, underneath the lake. The stress built up until it was relieved by a sudden large crack in the ice below the lake. Once the tension initiates the crack, the volume of water in the lake does play a critical role. 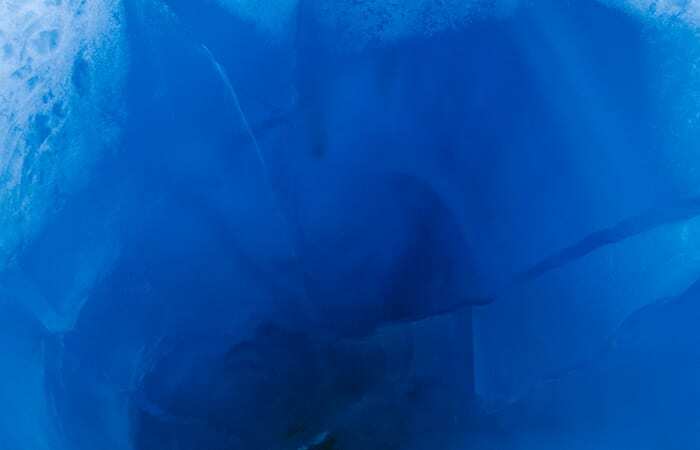 It surges into the opening with thunderous force, widening and extending the crack, and keeping it filled with water all the way to base of the thick ice sheet. “You need both conditions—tension to initiate the crack and the large volume of water to amplify it—for hydrofractures to form,” Stevens said. The key finding of the study is that without the former, even large supraglacial lakes will retain their water. 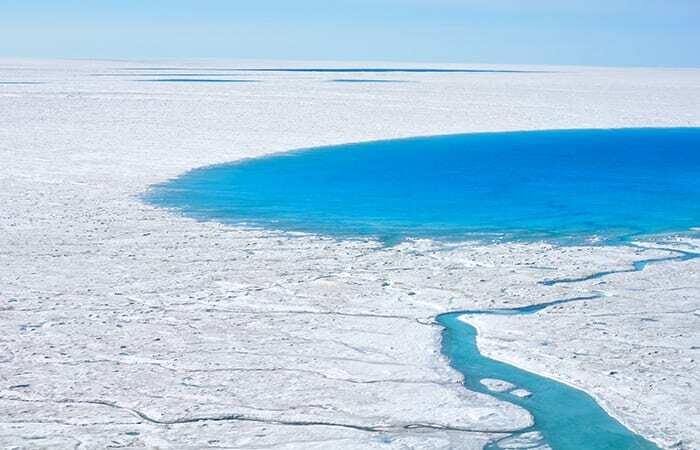 Discovering this new trigger mechanism changes the equation, because the trigger is less likely to occur at lakes at higher elevations on the ice sheet—even when those lakes are large. 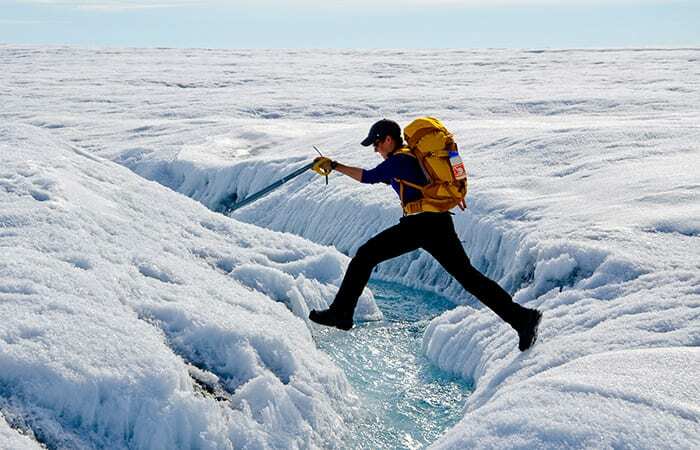 Stevens explained that the ice sheet further inland is thicker and moves more slowly. The ice deeper down flows more viscously, dampening impacts on the surface topography. That results in a flatter surface where fewer lake basins and fissures form in the ice. Fewer fissures means less water leakage to the base, which reduces bulging that increases surface stresses. 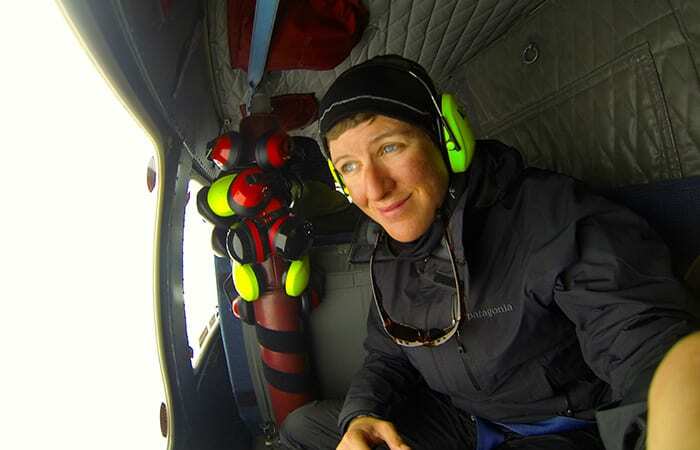 A little more than halfway toward her Ph.D. degree, Stevens has her sights on another half of the lake drainage story: How does all the water from lake drainages make its way along the bottom of the ice sheet? She has forged a new collaboration with Oxford University scientist Ian Hewitt, who has done extensive work modeling the hydrodynamic plumbing system in the difficult-to–access realm beneath the ice sheets. “The GPS network measurements from the days to weeks following lake drainages will be useful for tackling these questions,” Stevens said. Hewitt has developed a computer model of ice sheet hydrology from the terminus of a glacier at the coast to 50 kilometers inland. Stevens wants to collaborate to make a higher-resolution model that zooms into a 10-kilometer region, the area around one lake. The research was funded by the National Science Foundation’s Office of Polar Programs, the National Aeronautics and Space Administration’s Cryospheric Sciences Program, and an NSF Graduate Research Fellowship. The process starts when the returning sun begins to melt snow and ice into water that pools in depressions in the ice sheet to form lakes. Depressions can form at the ice surface as the ice sheet flows slowly forward over depressions in the bedrock. 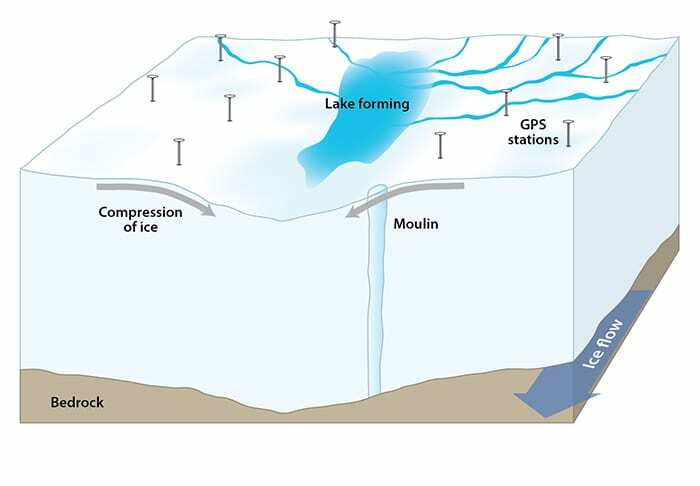 Moulins are conduits that connect the surface to the base of the ice sheet thousands of feet below. The depression directs the flow of ice downward, compressing ice on either side together at the bottom of the depression. As melting increases, more streams feed the expanding lake. 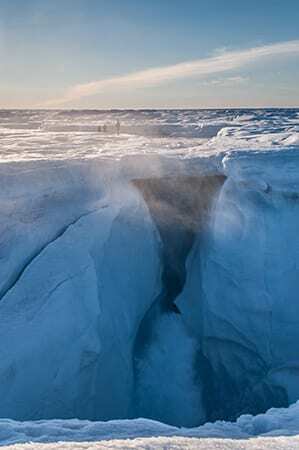 Water slowly accumulates between the bedrock and the base of the ice sheet. It eventually creates a bulge that jacks up the entire ice sheet. That creates tension that overcomes the compressional forces. The ice begins to stretch apart at the surface. The water also lubricates the interface between ice and rock, allowing the ice sheet to slide faster toward the coast. 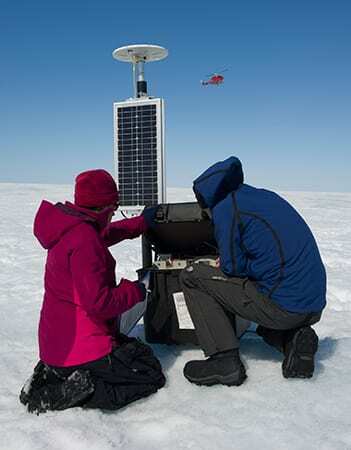 GPS receivers record the ice moving upward and forward. 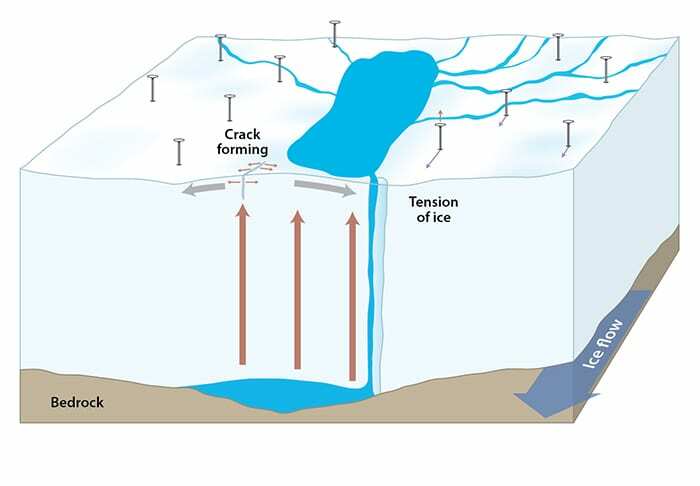 The tensional stress builds up until it is relieved by a sudden large crack in the ice that extends below the lake. The huge volume of water in the lake surges into the opening, widening and extending it, and keeping it filled with water all the way to base of the ice sheet. These cracks, called hydrofractures, drain the entire lake within an hour or two. Water flows out of the lake bottom faster than the water goes over Niagara Falls. The influx of water at the base of the ice sheet causes the ice sheet to slide faster toward the coast. 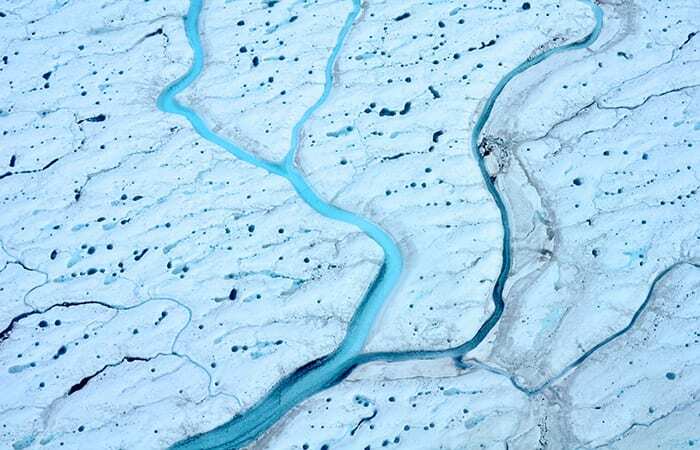 That accelerates the outflow of ice from land to sea and causes sea levels to rise faster.